After a chemical leak at the Hope Centre in Papua New Guinea (an organization devoted to feeding underdeveloped countries) turns its staff into flesh-eating zombies, a four-man commando squad led by Mike London are sent to investigate. 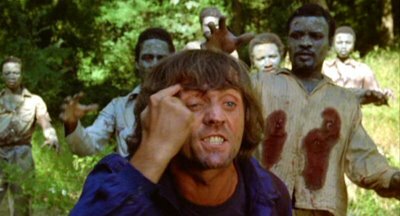 They run into a TV news crew led by celebrity reporter Lia, who are after the same story, but when they discover that the entire country has been overrun by zombies, what are the chances of them getting the message across? Can they still get to their Destination? Still it offers as neve being boring and of course everything that should be in a film like this, but lacks in Direction No Doubt. It kind of feels like a familiar story but overall it’s worthy. The acting isn’t half bad… Margit Evelyn Newton who plays Lia has added me on Facebook not once but twice (lol that desperate?). From the limited Experience and Direction from the entire cast Minus Franco Garofalo, They do a decent Job but Horrible Dubbing. They filmed the entire picture in Spain but overall a big thumbs up for making it look like New Guinea’s Jungle. But the Clear use of Stoke Footage of Animals jumping around makes it easy to spot with the change in picture quality, But laughable. The Special Effects are simply but good, But they can also be spotted as being extremely fake most scenes (Black Backgrounds, The Mansion Raid They cut the guys throat but he turns around too soon showing dry blood Pre-Applied). The Soundtrack is spectacular and performed by The Goblin, Excellent of all accounts… Big negative is the thing was stolen and used without permission (Again Mattei). Decent enough Editing but overuse of Stoke Footage that doesn’t match. Stock footage from the film La vallée was used for the native scenes. Vestron Home Video's release, around 1985, of the picture, under the title Night of the Zombies, was the same print used by Creature Features for home video tape in 1996. Creature Features added a brief card to the tail end of the closing credits for its copyright. This exact same print, even including the Creature Features copyright card, was used by Cydonia Pictures for its Night of the Zombies DVD release in 2002. 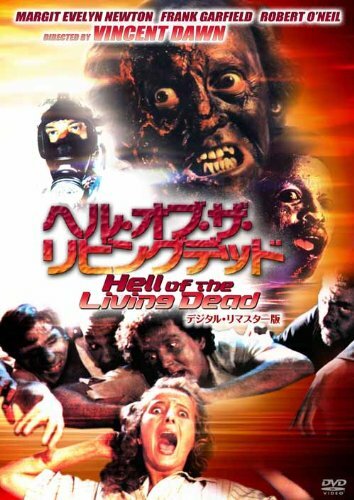 The same year, Anchor Bay Entertainment, released a cleaned up DVD under the title Hell of the Living Dead. All of these Night of the Zombies versions are identical, save for the inserted Creature Features copyright card. The film print is the infamous one known for being too dark, due to numerous copies being made, and, thus nearly impossible to tell a lot of what is going on in the film.